Haus Hochkar and neighbour, Haus Gamskar, are ruthlessly engineered for the skier and a short glide on skis to the lifts and nursery slopes at Nasserein. St Anton chalets which allow for skiing directly from the door are few and far between. Haus Hochkar and Gamskar have been carefully engineered and ruthlessly tailored to gratify the contemporary skier. No Alpine kitsch here, just straight-lines, comfort and space. Spacious bedrooms, smart contemporary bathrooms (with heated walls behind the towel rails … clever), an outsized living area and buckets of hot water. The infamous Tom Dooley's Bar is next door but one, the bars and restaurants of Nasserein are a quick toboggan ride or few hundred yard walk away and the pulsating roar of central St Anton nightlife is a ten minute stroll. Fabulous for families and those who like the click click of bindings a few steps from the front door. These are the ultimate luxury chalets in St Anton, we're sure of that. The rooms in Haus Hochkar are identical to those in Haus Gamskar. 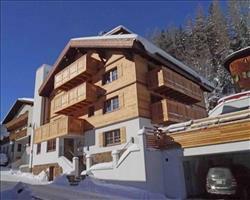 The additonal fifth bedroom means this chalet can sleep 10 - 11 guests. 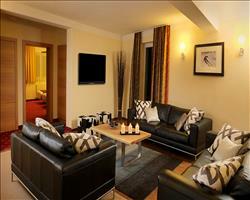 All rooms can be made up as Twin or Double beds and there is an additional single bed charged at half the adult price. Double/Twin with additional bed, balcony, en suite bath, hand basin and WC. (Additional bed charged at half the adult price). Space for cot. Double/Twin with balcony, en suite shower, hand basin and WC. We update Haus Hochkar's details often, but facilities do change. e.g. some extras listed by the supplier as "free" or included might only be for the first time you use them, or for one time per party, then charged for further use. If any specific feature is essential to your holiday, make sure you ask us to confirm the details of it before you book your holiday. This package holiday to Haus Hochkar in St Anton, Austria departs Sunday 8th December 2019, for a 7 night stay on a "catered chalet" board basis. A local tourist tax (Taxe de Sejour or Kurtaxe) is levied by many councils in European ski resorts. It varies by standard and type of accommodation and is age dependent, so not everyone is charged. It's not included in the basic price of your holiday and is usually paid locally. For reference, the average charged in winter 15/16 was between 50p and £2 per person, per night. St Anton lift pass price last reported as €228 (adult 6 day). Ask for a quote when booking Haus Hochkar. Haus Gamskar St Anton Austria, Gatwick to Friedrichshafen 8th December. "Pro's and Con's of Haus Hochkar"
"7.30am cup of tea was a particular highlight"
We have all been made to feel so welcome and looked after by Kirsty and Alisdair in the Hochlar chalet. The 7.30am cup of tea was a particular highlight, as well as the high standard of gourmet food that we all enjoyed throughout the week. Tim kept a careful eye on us and nothing was ever too much trouble. The accommodation was perfect. Our only complaint was that the towels were on the small side. "All in all a brilliant holiday the week before Christmas!" Such a welcoming and enjoyable week for our holiday-we hope it was the same for our chalet hosts too! Excellent food followed by excellent hospitality, Kirsty and Ali will be at the top of their game by mid season, let alone their first week! Comfy warm chalet however as the chalet is newly built you would expect minor details such as multiple towel rails in shower rooms and surround sound speakers in the living area.